Last Thursday, on a sunny evening when temperatures peaked in the 80s, a couple hundred neighbors who could have been enjoying themselves outdoors instead crammed into a stuffy basement room at the 2100 Building in Mount Baker to tell the city’s planning and land use committee—consisting, on this night, of chair, Council member Mike O’Brien and council members Sally Clark and Nick Licata—what they thought of plans to increase building heights around the Mount Baker light rail station. (We mentioned the meeting in Friday’s “Likes and Dislikes” Fizz). The most common theme in the comments — whether “yes but” or “hell no” — was the thirst for an economic development strategy for the Rainier Valley. With the gruesome economic history of the Southeast, many fear that without a conscious plan the storefronts will be empty and what jobs do exist in this neighborhood won’t be replaced. 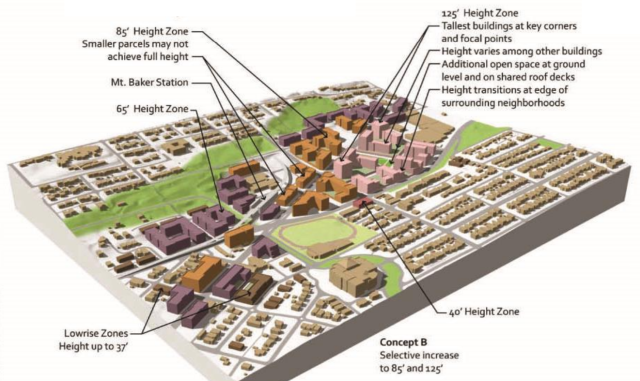 If you have yet to get the details on the major changes proposed to the area around Lowes and the Mount Baker Station (including 10-20 story buildings…(ok, it seems like the reports of 20 stories are a bit hyperbolic)), start here and keep digging through the links.